The following review first appeared in the November 2016 issue of The Spectrum Monitor magazine. 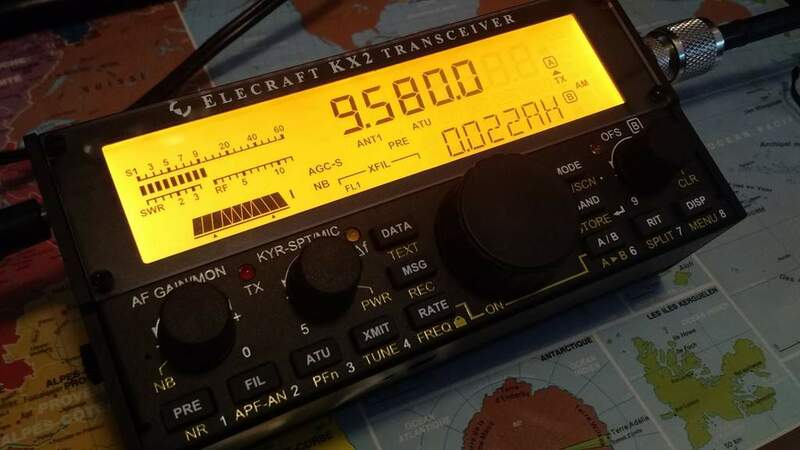 The Elecraft KX2 tuned to Radio Australia. It’s not every day that I get exciting news about the production of a new radio. 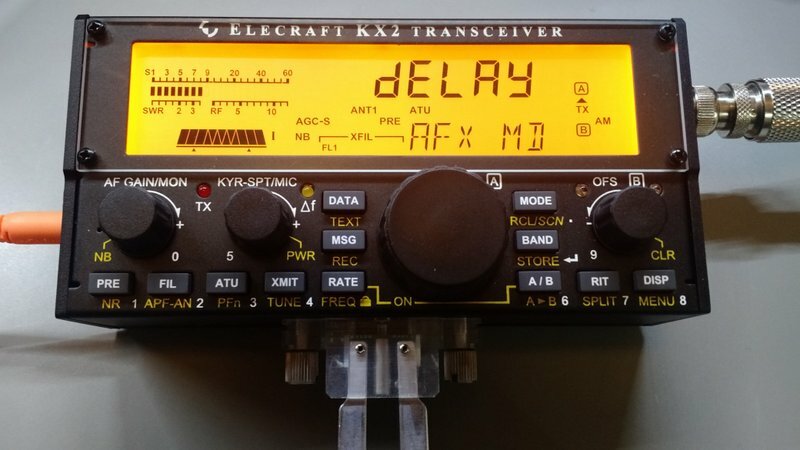 It was two days before the 2016 Dayton Hamvention–the day before the Four Days in May QRP conference–as I was eating lunch en route to Ohio, that I received the news: Elecraft had just announced a new transceiver, the Elecraft KX2. Wayne Burdick (N6KR) of Elecraft kindly sent me a few specs, and the following day, I previewed the KX2. 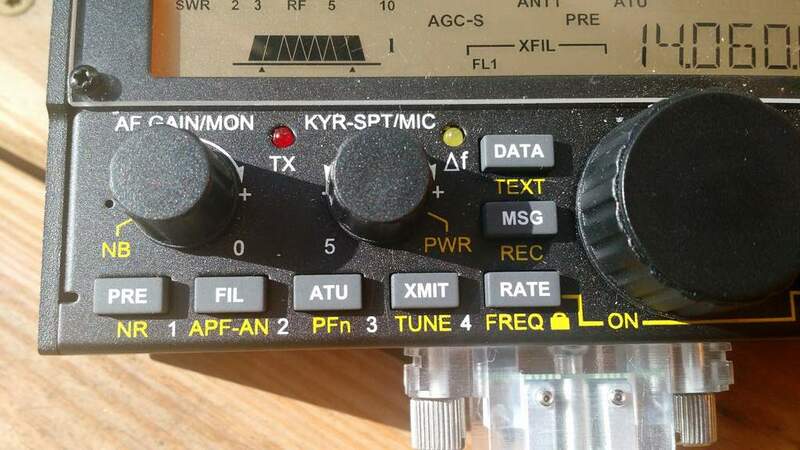 In short: the KX2 is a feature-rich pocket QRP transceiver. 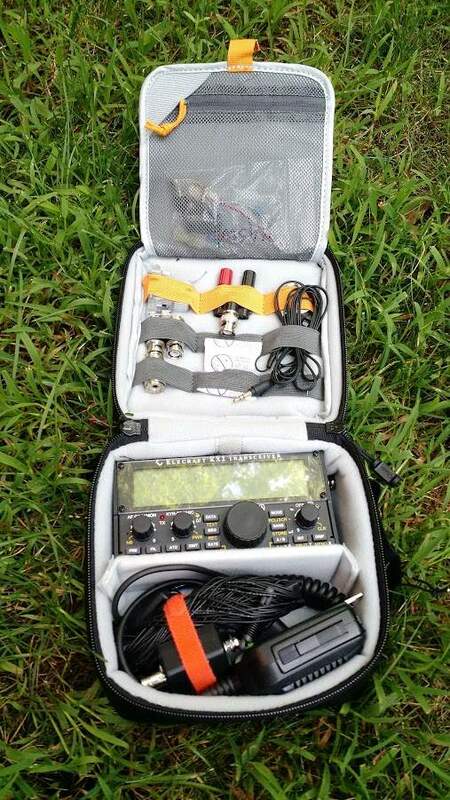 For those who are familiar with the Elecraft product line, it’s like a KX3 (feature rich portable rig) in a KX1-sized (much smaller, handheld/pocket) package. The day before the Dayton Hamvention, Elecraft allowed me to snap some photos, ask some questions, and generally give their new little rig a once-over. After holding their new offering in my hand–it’s slightly narrower, if a bit thicker, than a paperback book–was already tempted to plunk down $749 for the KX2 right then and there. So, what what stopped me? For one, I was less than two weeks away from taking a two month trip in Canada, and already had an (embarrassingly) large number of radios to take along. I also had a few other reviews in the works and needed to finish them prior to evaluating the KX2. And–let’s face it–that kind of cash is significant to a reviewer like me. Yet there was another consideration–two, actually: I already own both the KX1 and KX3 transceivers, and like them very well. Come on, I chastised myself, as I continued to admire the latest Elecraft in its tiny package. Wouldn’t a KX2 be rather…redundant? Nonetheless, in August I took the plunge and ordered a KX2. Perhaps it was a leap of faith…or a momentary lapse of judgement that led me down temptation lane. At any rate, I had been doing enough NPOTA activations that I fell for the idea that I could potentially have the advantages and performance of the KX3 in an even smaller, even more portable, package. Would there be buyer’s remorse? The only way to tell, obviously, was to put the KX2 on the air. 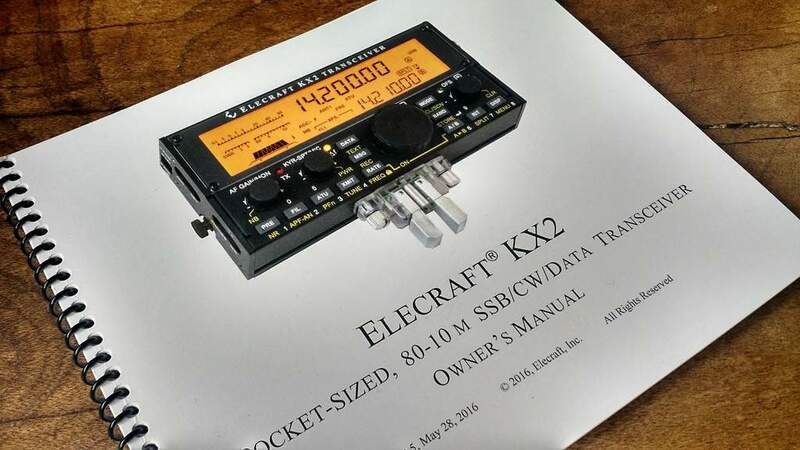 I imagine a lot of new KX2 owners will be Elecraft veterans like myself. Once you’ve used Elecraft equipment for a while, you begin to understand how the company designs their menu trees and functions. In other words, once you’ve experienced the Elecraft ecosystem, moving from one radio to another becomes easier. The KX2’s on-board microphone is located on the left side of the front panel and works very effectively especially in an HT configuration. I approached the KX2 with confidence, having owned the similar KX3 for three years and the K2, K1 and KX1 for many years. The left side of the KX2 is where all connections are located, save the antenna connector. 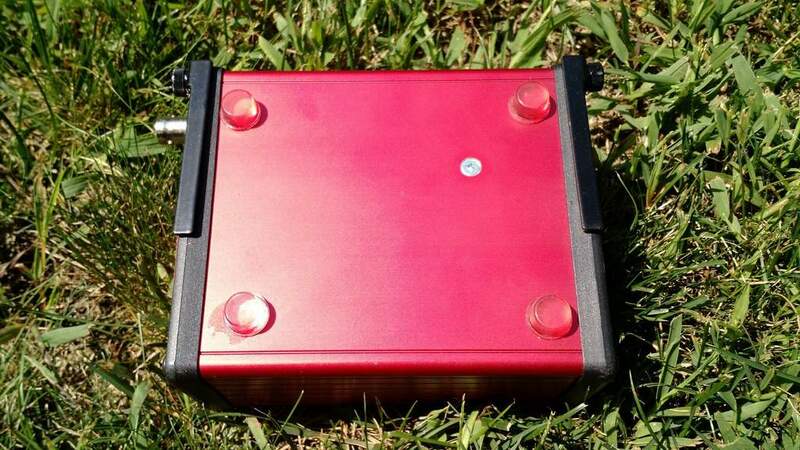 The BNC antenna jack is located on the right side of the KX2. I plugged the KX2 into my power supply, main antenna, and powered it up by pressing the Rate and A/B buttons simultaneously (a clever keylock method). 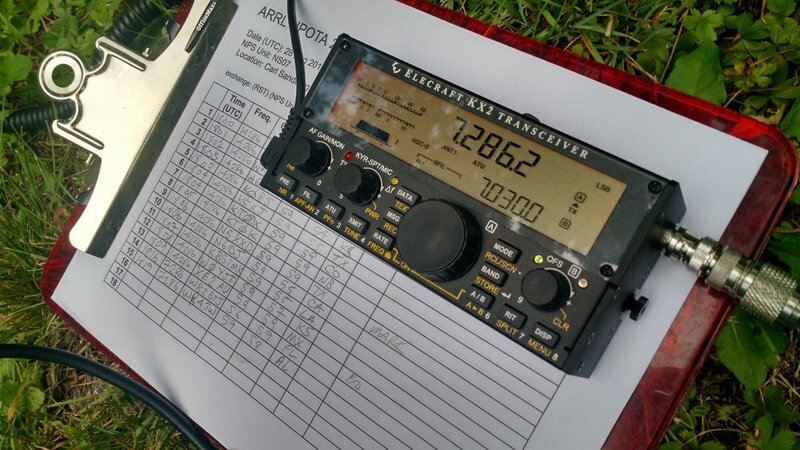 The KX2 defaulted to the 20-meter band. I started tuning around and quickly realized that the SSB mode was set to the lower instead of the upper sideband. No problem, I thought, and instinctively pressed and held the MODE button to switch from LSB to USB. This is where I found the first difference between KX2 and KX3 functions. Pressing and holding mode button on the KX3 toggles USB/LSB, but on the KX2 it enters the frequency memory store mode. I tinkered with the KX2 MODE button to no avail, so reached for the KX2 owner’s manual, fortunately a well-written tome. Turns out, to switch between USB/LSB, you: enter the KX2 menu system, select the ALT MD entry, then switch the “alternate” to the “normal” SSB band mode, which moves it to USB on the 20-meter band. A number of functions accessed on the front panel of the KX3 require using the menu system on the KX2. RF Gain is another example of this, as I discovered pretty quickly. This got me thinking. I don’t envy the folks at Elecraft who have to sort out the ergonomics and functionality on a radio as small as the KX2. I decided I’d better check out the owner’s manual and familiarize myself with the functions I use the most in the field. Elecraft manuals are superb; they’re spiral bound, easy to read and comprehensive. 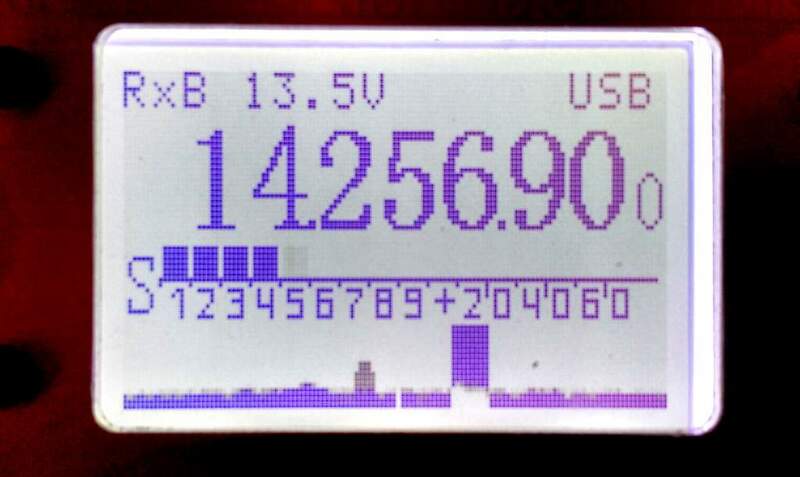 I must say, Elecraft has done an admirable job of keeping the most essential functions on the face of the radio and tucking the less-used functions into the background of their menu system [Not to suggest access is ever complicated, considering that you just 1) enter the menu, 2) select the function, and 3) change the parameter…that’s it.] No doubt, the reason for their success is the fact that their key designers, like co-founder, Wayne Burdick (N6KR), actually operate radio in the field–they get it. Speaking of the field, that’s exactly where I wanted to take the KX2 to test, since that’s clearly where the rig’s designed for use. Note here that this is not a base rig: its size and features lends itself very well to a pack radio–one I wanted to keep packed and at-the-ready! Prior to receiving the KX2, of course, I did some pack research (those of you who know me know that I’m a bit of a pack geek). Elecraft was actually selling two models of a LowePro pack that fit the KX2 exactly: the ViewPoint CS 40 and ViewPoint CS 60. Though I searched far and wide, I couldn’t find a pack from some of my favorite manufacturers (such as Spec-Ops Brand, Red Oxx, and Tom Bihn) that has the right amount of padding, exact space and fit for the KX2, as did the CS 40 and CS60. So I purchased the larger CS 60–the larger of the two packs. All of this–save fishing line, weight, six-foot coax cable and clipboard–were protected by the compact and perfectly portable LowePro ViewPoint CS 60 padded case, and fit it like a glove. I tucked the whole kit quite conveniently into my 20-year-old Dana Design lumbar pack. The only way to know if the kit was complete, was to take it to the field. Nothing like trial by fire. My first NPOTA activation with the KX2 field kit was at the Carl Sandburg Home in East Flat Rock, NC. 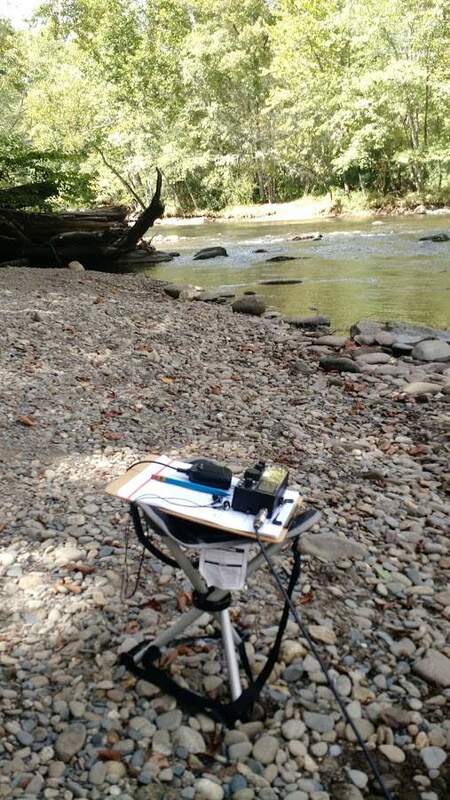 After hiking about twenty minutes to my trail location and setting up the station, which I found to be a fairly simple process, I realized that the KX2 is so compact that it easily fit on the clipboard I was using to hold my log sheets. Thus, the clipboard instantly became my laptop operating table. As soon as I sat down in my folding chair, I turned on the KX2, set the frequency to 14,286 kHz, and pressed the ATU button, which gave me a 1:1 match (since the EFT is resonant). pressing XMIT again to stop the recording. Then, I started calling CQ by simply pressing the MSG button and selecting my message stored in memory allocation 1 by pressing and holding the PRE (1) button. It’s a brilliant and easy function which saves my voice. 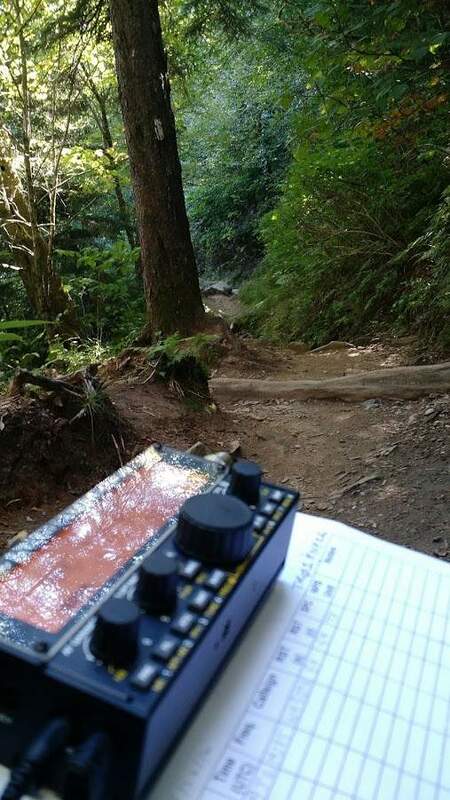 By automatically calling CQ, it gives me an opportunity to answer questions from curious passersby who were naturally fascinated by a guy sitting on the side of a trail, talking into a little box connected to a tree-branch suspended wire. In the end, I didn’t even need to use the voice keyer that much. I worked my minimum of ten stations within six minutes! Of course, I continued to call CQ until I worked everyone in the pile-up (including stations from California, Nebraska, Kansas, Texas, and Mexico–thanks, folks!). Result? Wow. That first field experience at the Carl Sandburg home couldn’t have gone better. And the KX2 had quite a lot to do with that outcome–both in function and form-factor. Since then, I have taken the KX2 on more than twenty NPOTA field activations, and my compact field kit is making impromptu activations a breeze. 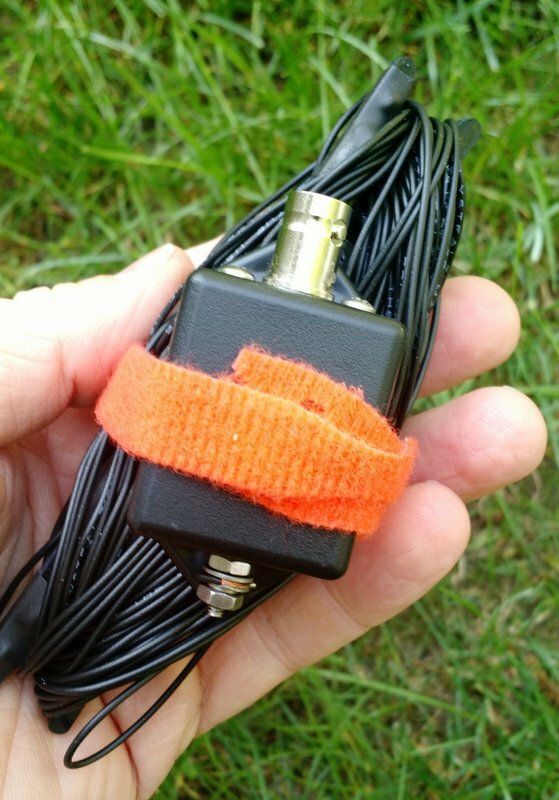 Indeed, by the time you read this review, I’m guessing I’ll have added a dozen more NPOTA activations with the KX2 field kit. One of the things that make the KX2 so easy to set up is the fact it can run quite effectively on a high-capacity internal LiPo battery pack. On one particular set of activations, while returning from the W4DXCC conference in late September, I activated several sites, including a couple of “two-fer” sites, just during my drive home. I only used the KX2’s built-in battery to power the rig. I was on the air almost three full hours of fairly intense transmitter use (repeating my CQ call through the voice keyer). The KX2 was able to pump out a full 10 watts of power for a little over one hour, then as the voltage dropped, it reduced output to 5 watts. I feel like this is impressive performance from such a small battery pack. It’s a little pricey (at $84.90 US for both the battery and external charger), but very much worth the cost if you’re splurging for a KX2, anyway. View of the Elecraft KX2 battery compartment. Note the speaker wires which attach the two halves of the chassis. One complaint: I’m not crazy about the fact that the LiPo battery must be removed from the KX2 in order to be charged. To gain access to the battery, you loosen the two thumb nuts on either side of the KX2, then carefully open the back compartment. You must be careful because two speaker wires are attached to the back panel which holds the internal speaker; if you yank it open, you could disconnect the speaker. 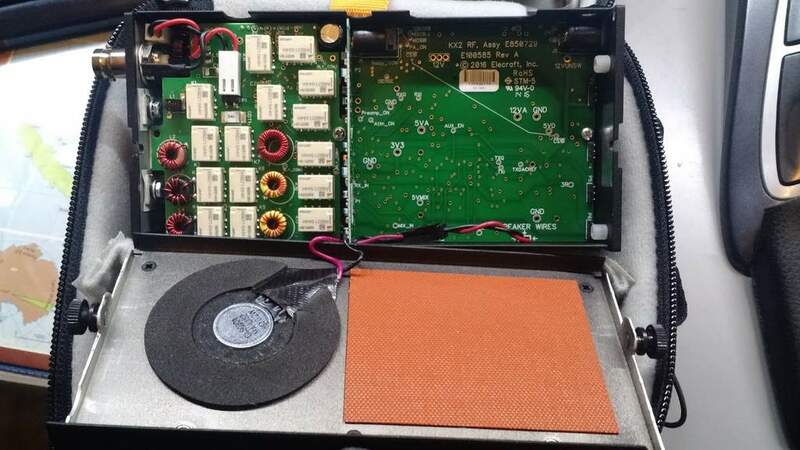 I’ve read a report from an NPOTA activator who said that, in the process of multiple openings/closings of the back plate, the speaker wires have rubbed bare spots on the insulation. He used black electrical tape to fix the problem. So far, I haven’t noticed this, but I certainly see how it could happen with time. Operating a NPOTA “two-fer” under the Blue Ridge Parkway and in the Great Smoky Mountains National Park. In the end, I give Elecraft a little grace on this point. After all, this is the first transceiver they’ve ever produced that doesn’t have a kit form, plus they’re trying to satisfy the needs of battery and charging circuit while keeping costs down, as well as make everything fit in an almost paperback-sized enclosure. Frankly, this works fine. I don’t mind the extra care required because, in the end, having such a capable internal battery outweighs any inconvenience of charging at home. Elecraft, if there’s a way to reinforce the speaker wires, that would likely help. I ordered the KXAT2 internal ATU option with my KX2. Having used the KX3 internal tuner for years, I guessed this might be an excellent ATU, as well. And it is. In the field, I’ve used a variety of wire antennas, and the KX2’s internal ATU has matched them beautifully. So, exactly how good is the KXAT2? The following story will give you an idea. 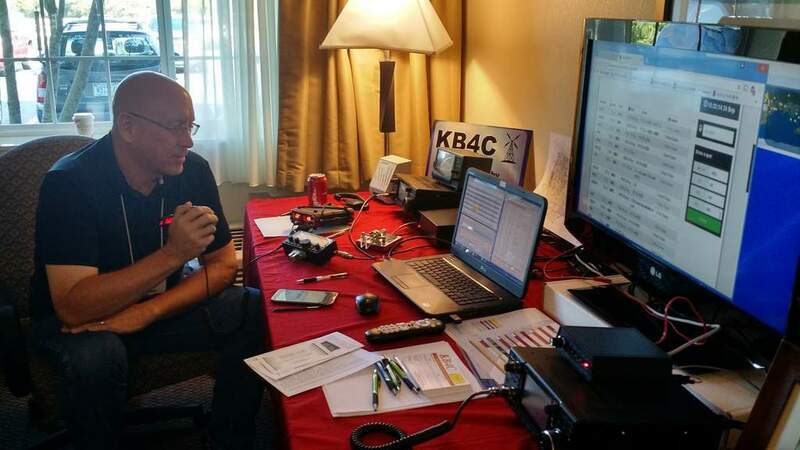 I brought my KX2 along to the W4DXCC conference in late September. The conference has a club station that consists of two Icom IC-7300s which are hooked up to a variety of antennas. 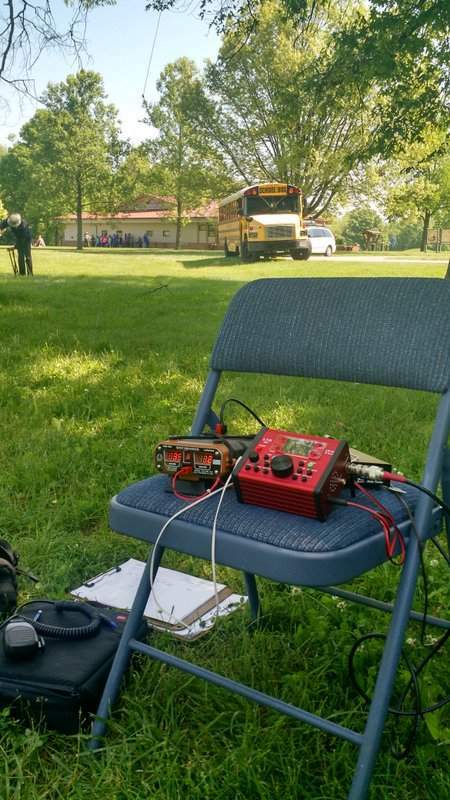 During the conference, my buddy WD8RIF was activating a particularly rare NPOTA site. My only chance of working him was on 40 meters. Conference attendees took turns operating the KX2. Unfortunately, out of all of the self-supporting antennas erected on site, none were resonant below the 20 meter band. I had no means to properly hang my 10/20/40 meter EFT Trail-Friendly antenna at the hotel, so out of desperation, I tried to load a 20 meter hex beam on 40 meters at QRP power using the IC-7300 and its internal tuner. In short, the IC-7300’s ATU couldn’t find a match and refused to transmit. But I had my KX2 in my field pack. I set up the KX2, connected it to the 20M hex beam, tuned it to 40 meters, and hit the ATU button. The KXAT2 promptly found a 1:1 match! 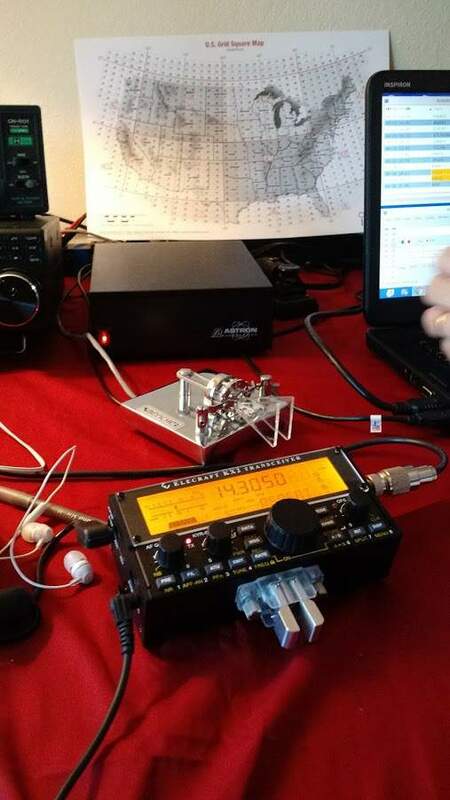 Using the Elecraft KX2 on 40 meters at the W4DXCC conference while attached to a 20 meter hex beam. Granted, we were only operating 10 watts, but even the IC-7300’s internal ATU wouldn’t work at that same power level. In short, if you plan to operate portable with the KX2, do yourself a favor and order the KXAT2 internal tuner, as well. Clearly, it’s ability to match is impressive. 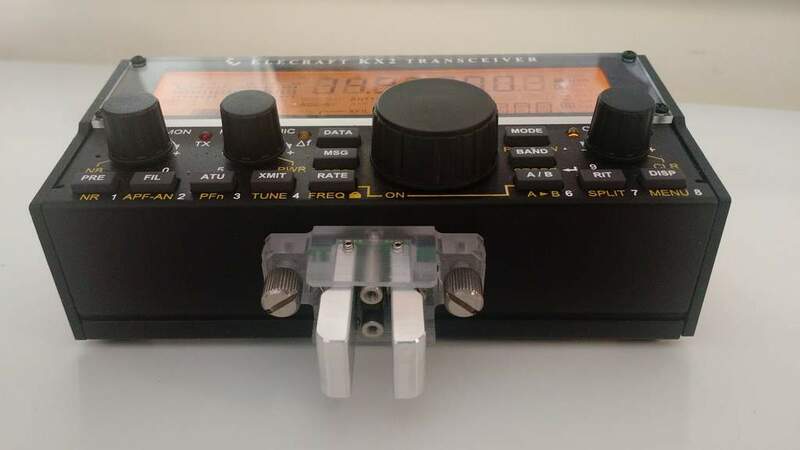 Elecraft also sells a small, attachable paddle that is custom-made for the KX2–it’s called the KXPD2 keyer paddle. I had not planned on acquiring a KXPD2 as I’m not the biggest fan of paddles that are attached directly to radios. I did, however, think back to my KX1 and the many times I operated CW while holding that little rig in my hands. To be clear, though, the KX1 paddles are primitive in comparison to the KXPD2, which has adjustable contact spacing and even built-in allen wrench storage. One night at my local radio club, I passed the KX2 around with the KXPD2 attached and received a number of positive comments about it. I find it a pleasure to use, too, and lightyears better than my KX1 paddle. In the field, I personally find the two thumb screws which attach the KXPD2 a little small to turn fluidly. This is due, primarily, to the fact I have bigger fingers. Steve (WG0AT) experienced the same problem, and came up with a creative solution: silicone rubber tape. He simply wrapped the tape around the thumb screws, giving them a larger tactile surface area. I’ll try this with my KXPD2 paddle screws, as well. The KXPD2 is a brilliant little key, I must admit. I say this even though I feel the $109.95 price is rather high. Still: it’s a quality little product and I’ve been very pleased with its smooth action and precision. And, oh, yeah–a bonus–it will fit my KX3 as well! 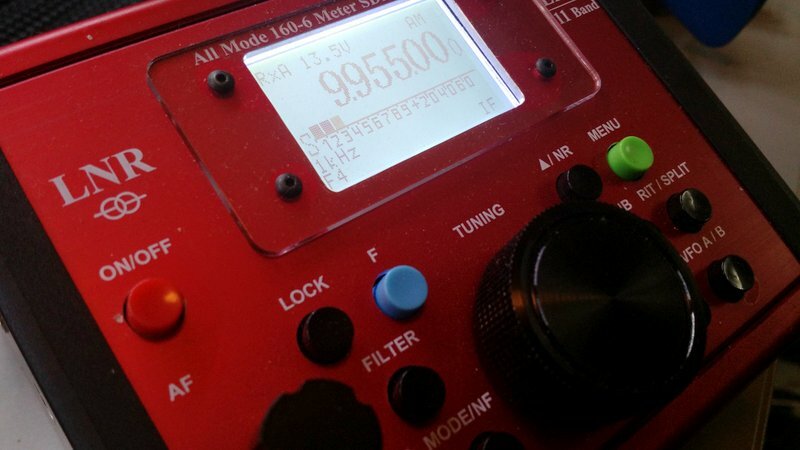 In August, Elecraft pushed out a Beta firmware release on the KX2 which included AM mode. Following this release, I received a number of inquiries from SWLing Post readers asking for a comparison and audio samples. 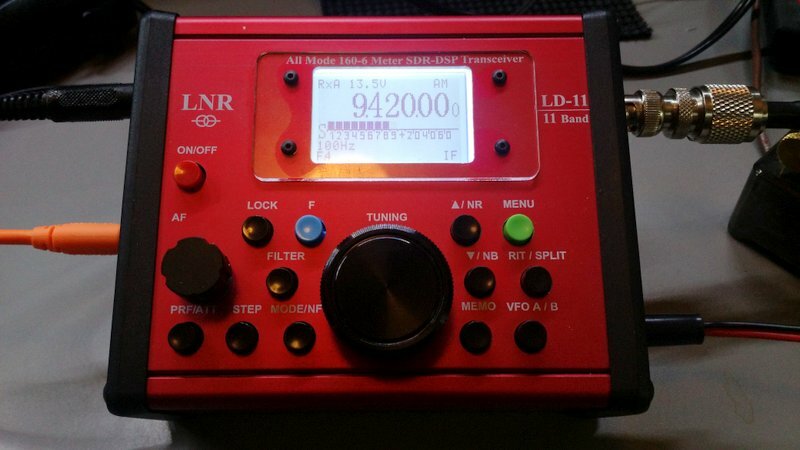 At the time, I had the excellent LnR Precision LD-11 transceiver in the shack, so I thought I’d do a quick audio comparison with the KX2 since both price points are similar and both are transceivers with AM mode. I set the LD-11 to a bandwidth of 9.6 kHz, and the KX2 to 5 kHz: the widest AM filter settings of each. Keep in mind, of course, that this is was not an apples-to-apples comparison, but it did showcase each radio’s potential AM audio fidelity. To make the playing field as even as possible for these two disparate units, I tuned both rigs to the Voice of Greece on 9420 kHz around 00:30 UTC. VOG’s signal was strong into North America. I made the following recordings with my Zoom H2N digital recorder, feeding in-line audio patched from each radio’s headphone jack. I tried to balance the audio levels between the two rigs as closely as possible to one another. The results from both radios are duly impressive. Since the LD-11’s bandwidth can be widened to 9.6 kHz, strong signals like this one sound pretty darn amazing. In truth, I actually prefer a filter width of about 8.2 kHz on strong signals, but VOG was wide enough to justify 9.6 kHz. I believe the LD-11 would rival many dedicated tabletop receivers. The Elecraft KX2, in normal audio mode, sounds flatter and narrower than the LD-11 of course, but still remarkably pleasant–a surprise, considering its limitations. In the KX2’s “delay” DSP audio mode–available when headphones are used–the signal sounds much wider than 5 kHz, though the effect adds a little graininess to the audio. That’s okay, however; I appreciate having the “delay” audio option in my tool bag. In the past several months, I’ve used the KX2 for shortwave broadcast listening, and each time I’ve been happy with it. It’s an exceptionally sensitive and selective receiver, with a stable AGC, thus would please the most dedicated DXer. Does it have the audio fidelity of the Drake R8B? No way. But its audio is very good, nonetheless, and it can dig weak DX out of the noise as well as any of my dedicated receivers. 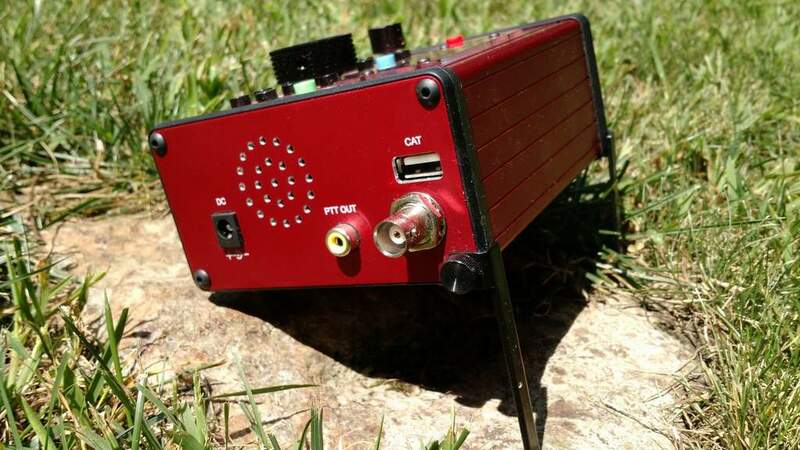 After all, this is a ham radio transceiver, not a broadcast receiver, so I’m impressed that it can double as both. So, don’t plan on doing any mediumwave DXing with the KX2. It is sensitive enough, however, that I can receive strong local stations reasonably well. Let’s be frank here: the cons I’ve listed above are rather nitpicky. I suspect Elecraft will work on a better solution for the speaker wire (for those of us using the internal battery) or else KX2 users will come up with a creative modification. In a perfect world, I also wish the KX2 were somewhat weather-proof or water-resistant. A couple of times, I’ve been operating in the field when rain caught me off guard. I feel like the KX2 is pretty vulnerable, so I either pack up the radio and stop operating, or I seek shelter if it’s available. It wouldn’t take a lot of moisture to penetrate the KX2 and there’s no way I’m letting rain ruin my rig. But I’m guessing weatherproofing would add significant cost. So, did I experience any buyer’s remorse after purchasing the KX2? Not in the least. Between us, kind reader: the KX2 has been a difficult rig with which to find fault. Price and inherent compromises for portability aside, there are really no serious negatives about this radio in my book. It suits my purposes very well. 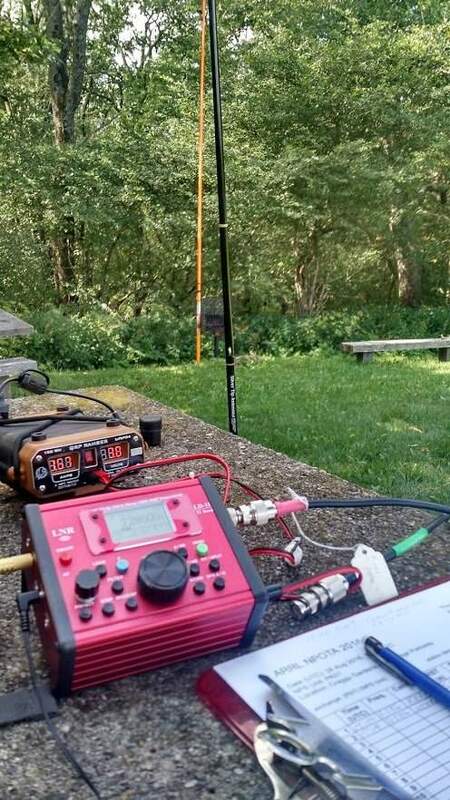 Activating the Blue Ridge Parkway (PK01) with the Elecraft KX2 and “Silver Tip” 20 meter vertical. An effective combo! I’m not a fanboy of any brand. I love to see companies introduce successful original products. I believe companies like Elecraft, CommRadio, LnR Precision, Elad, Icom, Yaesu, Kenwood, SDRplay, and the like are healthy for our hobby. Competition and innovation are worthy friends. 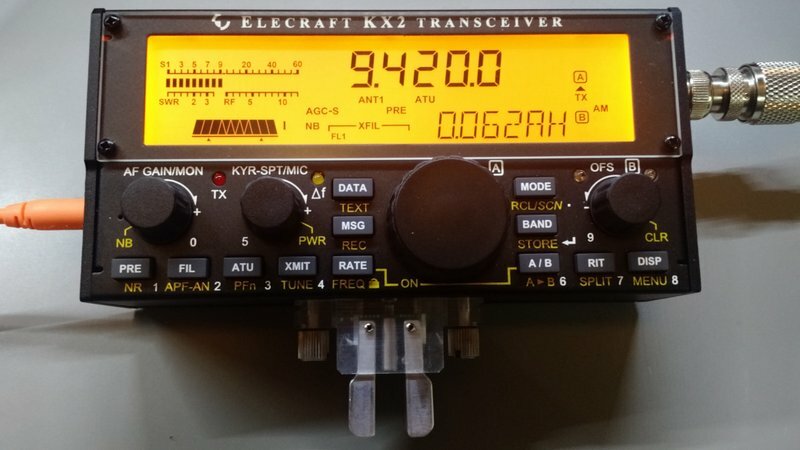 Elecraft pushes our ham radio hobby forward, and it’s innovations like the KX2 that make our radio market and our hobby a dynamic and inventive space. To be clear, I know the KX2 didn’t come out of nowhere. 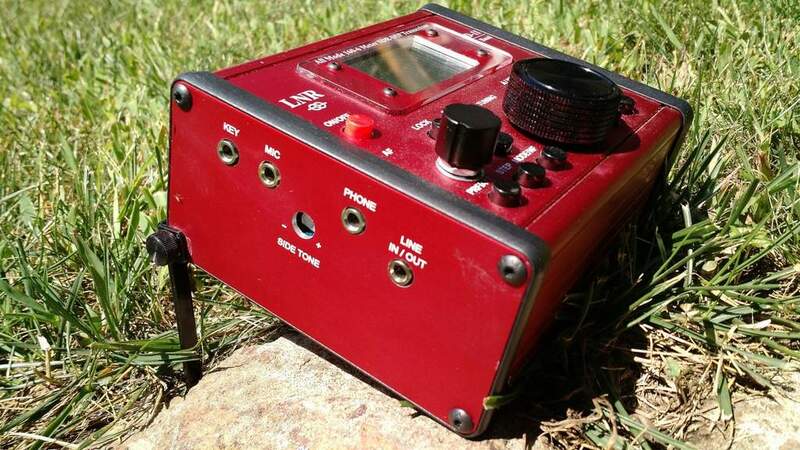 It’s the culmination of many iterations of Elecraft transceiver designs over the past eighteen years. Elecraft has taken feedback from customers, made notes, and improved their products with time, and it shows in this little rig. 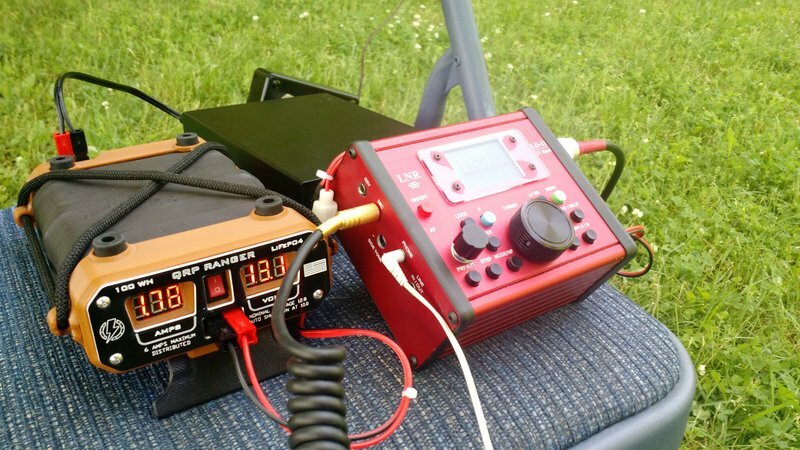 The Elecraft KX2 is clearly a product of iterative agility. It will, no doubt, be a market success. 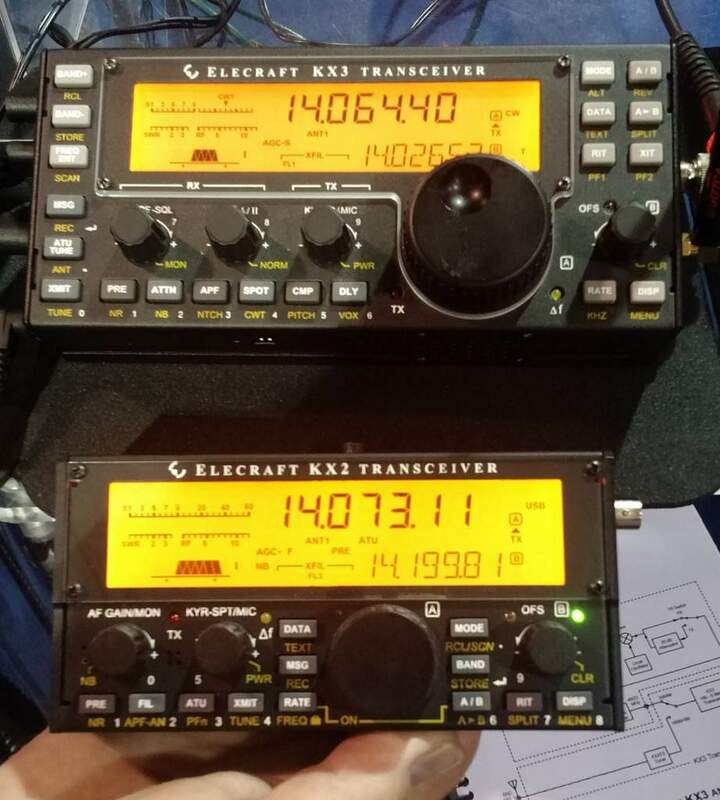 I remember when Elecraft co-founder Wayne showed me the KX1 many, many years ago at the Dayton Hamvention. He told me that the KX1 was a step toward the perfect portable radio he’d dreamed of as a kid. The KX2 is simply that–and a profound upgrade of the KX1. But more to the point, it might have been the portable of which I dreamed, too. 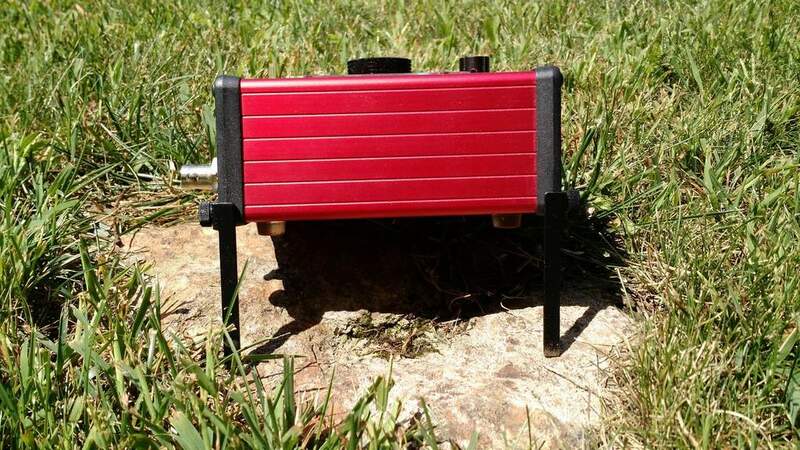 This entry was posted in Ham Radio, New Products, News, Radios, Shortwave Radio and tagged Dayton Hamvention, EFT Trail-Friendly Antenna, Elecraft, Elecraft KX1, Elecraft KX2, Elecraft KX2 review, Elecraft KX3, General Coverage Transceiver Review, General Coverage Transceivers, KX2, LNR Precision LD-11, NPOTA, QRP on December 1, 2016 by Thomas.